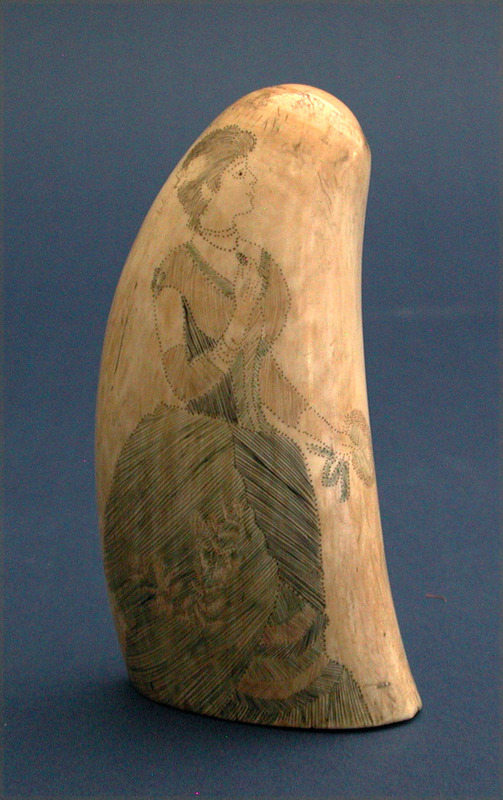 NICELY ENGRAVED AND COLORED SCRIMSHAW TOOTH with a full portrait of a beautifully dressed female who is standing and touching a pendant on her neck with one hand while holding a bouquet of flowers in the other hand. All the engraving is highlighted with soft polychrome coloring. 5 1/2" h. x 2 3/4" w. Condition very good and tooth has acquired a nice age patina throughout. This work executed by the same artisan as the tennis lady tooth illustrated on page 57 in Flayderman's "Scrimshaw and Scrimshanders". I have had his work several times before with some of the examples decorated on the reverse with the artist's symbol that looks like a Union Jack.